This wonderful American Tourister Aller Backpack is just the one you were looking for. American Tourister has been a brand name of trust in the world of bags. The quality has always been superb. This backpack is compact on the outside and spacious in the inside. It has a stylish and casual design. It is good for schools and college to pose that trendy self. This backpack also has a generous padding on back and shoulder straps. This wonderful American Tourister Aller Backpack is just the one you were looking for. 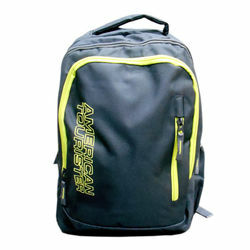 American Tourister has been a brand name of trust in the world of bags. The quality has always been superb. This backpack is compact on the outside and spacious in the inside. It has a stylish and casual design. It is good for schools and college to pose that trendy self. This backpack also has a generous padding on back and shoulder straps.